1W3KND Writers in Residence Announced! 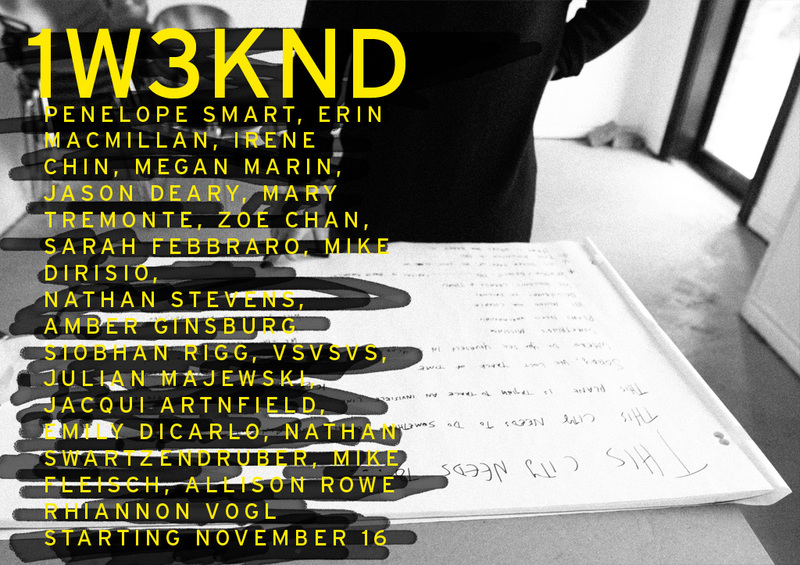 1W3KND starts on November 16 and we’re incredibly excited to announce the list of selected participants that we’ll be hosting at CIVIC SPACE. But first, some background on the project. 1W3KND is aimed at developing essays, interviews, manifestos, critiques, reviews, and other texts around ideas of collaboration, socially engaged works, artist-run culture, and public practices. We’re hoping to publish these in one form or another some time next year. There have been a number of books released over the past year discussing socially-engaged practices (here’s a list of a few of our favourites), but we’re really interested in reading more from artists themselves, especially those in the earlier stages of their career. We think there’s a need to make more time to write through the ideas, questions, and concerns that come through engaging in these kinds of practices, and we’re hoping we can help to accommodate those interested in doing that writing. And now, here’s the list / calendar. If you want to connect with anyone, let us know! I am eagerly awaiting the publication(s) that come out of this. Great project.